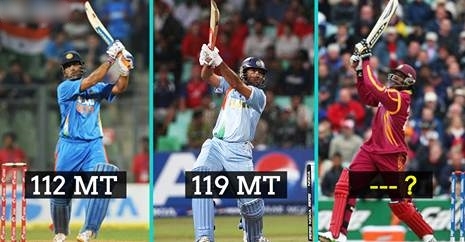 One of the hard hitter from Indian team, Ms Dhoni makes his name in this list. During the 2011-12 Commonwealth Bank Series against Australia, India required 12 off 4 deliveries. The right-hander hit the 112m massive six to Clint McKay. Pakistan’s one of the star player, Ijaz Ahmed played 60 test, 250 one-day games. During a match against India, he smashed Sourav Ganguly for a gigantic 115m six over long off. One of the dangerous hard hitter, Chris Gayle is the best batsman in the world when it comes to T20 format. During the T20 World Cup match against India in 2010, he hit mammoth 120m six in Yusuf Pathan’s over. Corey Anderson, one of the aggressive cricketer New Zealand have ever produced. He loves to hit from the very first ball instead of taking time to settle. During the match against India in 2014, he smashed Mohammed Shami for unbelievable 122m six over deep mid-wicket. The list will be incomplete without this player. Pakistan’s destructive all-rounder Shahid Afridi held the record of fastest ODI hundred for the long time. His ability is to hit big sixes. His biggest six was came against Australia in Perth. The distance of the six could not be measured. Once again Ms Dhoni makes in this list with his hard hitting abilities. During the match against New Zealand in 2009, Msd starts his destructive shots after the platform set by the top orders. He hit a helicopter shot over the long off in the 44th over of the innings. One of the finesh batsman from Australia, Mark Waugh hit the gigantic six of New Zealand spinner Daniel Vettori in 1997. During the second test against New Zealand, Mark Waugh smashed Vettori for a long six over bowler’s head. No one forget his name when it comes to T20 format. He is one of the best player India ever produced. During the 2007 WC, he smashed six sixes in an over against England. He played another brilliant innings against Australia in the semi-final as he scored 70 off 30 balls. During that innings, he smashed 119m six of fast bowler Brett Lee. On of the greatest fast bowler in the world, Brett Lee conceded some big sixes in the cricket. But, the surprise is that he hit one of the longest sixes in the International cricket. He hit one of the biggest six against West Indies in the year 2005. This man deserved this first sport in this list. He is one of the hard hitter in the world as he smashed many sixes with his muscles. During the match against South Africa in 2013, he smashed Ryan McLaren for the biggest six in the world. The ball went into the golf course neighbouring the cricket ground.